​Looking for the perfect mix of boutique bevvies, appetising eats and fun activities on your next road trip? Then put Lovedale on your bucket list. This laidback neighbourhood used to be a side-shoot to the Hunter heartland of Pokolbin but after the opening of the Hunter Expressway it's now the gateway to Wine Country for most visitors. The back door is now the front. And it's a tasty little entree to the region with sweeping mountain views, ribbons of vineyards and plenty of places where you can sip, snack and shop along the winding country roads. No surprise that some people plant themselves in Lovedale and explore no more. Here's all the inspo for your next weekend away. ​One of the things I love about Lovedale is that it's full of brilliant boutique wineries you've probably never heard of. Like Lucy's Run. It's small and unassuming – think just nine acres of vines and a green Colorbond shed for tasting – but owners Brad and Heather Wright are downright charming… as are their Verdelho, Merlot and Shiraz wines, made by talented winemakers Mike De Iuliis and Nick Paterson. There's a dog on the wine label and they created another label called Woof Woof Wines to support PetRescue, so your pooch is welcome here too. Stomp Wines! is another that flies under the radar. Originally located in Broke they moved to their new stomping ground last year on Wilderness Road. If you're looking for a small and personal wine-tasting experience, you'll find it here. You'll also find some very gluggable wines under their main label – the white Fiano served with truffle Pecorino is a fave – as well as the tongue-in-cheek Pssst 'n' Broke range. Gartelmann Wines is a family-owned winery that produces some terrific tipples too. You can't miss the giant magpie mascot on the cellar door wall so swoop in and taste some kickass Semillon, Chardonnay and Shiraz made by gun winemaker Liz Silkman on the deck overlooking the dam. And if you want a sunset shot that will be #photooftheday, you can't beat Allandale Winery. You may come for the scenic views but you'll stay for the great wines. 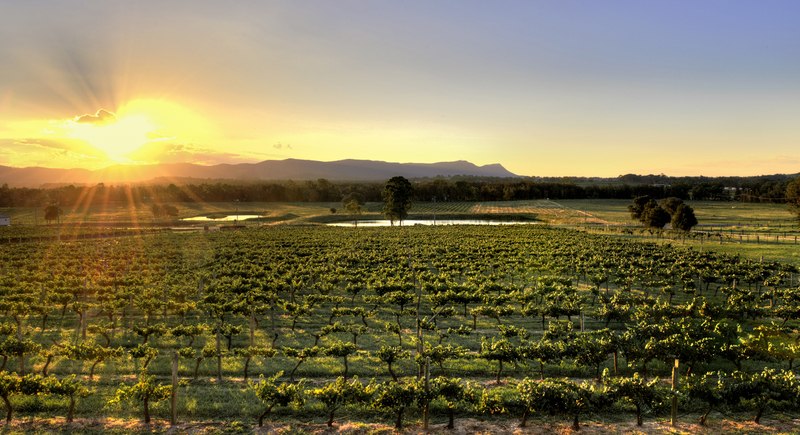 It's hands down the best spot to sample lip-smackingly good Chardonnay, Semillon and Shiraz watching the sun slowly sink behind the Brokenback mountain range in Lovedale. ​You can't visit Wine Country without having at least one meal in a winery restaurant and Lovedale has some absolute crackers. If you're looking for a spot to unwind and enjoy the simple pleasures of country life, head to The Deck Café at Gartelmann Wines. It's open seven days for breakfast and lunch, with owner/chef Matt Dillow offering everything from pancakes and hangover rolls for breakfast to burgers, pasta and gin-cured salmon gravlax for lunch. Even after a big expansion it draws crowds so if you want to snag one of the outdoor deck tables perched beside the dam, you'll need to book. Tapas and vino are natural companions and you can enjoy both at Tatler Wines. The restaurant serves a variety of Spanish share-plate snacks that hit the spot like patatas bravas and goat's cheese and caramelised onion tarts. One of the biggest drawcards is the fab outdoor dining area that overlooks the dam and gum trees. Hunter on a plate. Emerson's Cafe and Restaurant at Adina Vineyard is another well-regarded local thanks to owner/chef Emerson Rodriguez's carefully crafted food, which is always as artistic as it is appetising. Everything from nasi goreng with a fried egg for breakfast, duck pate for lunch to oxtail ravioli for dinner. You can dine indoors, alfresco on the verandah or in the kitchen at the Chef's Table. ​Lovedale is also home to a flourishing gourmet food scene so you can taste and take home some mouth-watering locally made treats. You can nibble your way through a range of soft cheeses at Binnorie Dairy. Marinated fetta, ripe brie and creamy labna are standouts at this dairy dynamo but owner Simon Gough also makes some out-of-the-box salamis too. Tastings are free and you can also snack on soup, ploughman's platters and ricotta cheesecake washed down with Belaroma coffee. Another fabulous food producer is Ben Sales at Lovedale Smokehouse. He makes an extraordinary selection of handmade charcuterie and smoked goods including vine-smoked bacon, duck, salmon, and kangaroo to tasty terrines and pates, dressings and smoky sauces. If a taste isn't enough, you can take a seat in the on-site restaurant, which showcases the artisan smokehouse produce, and he runs regular cooking classes too. There's also a thriving olive scene in the Valley so head to Adina Vineyard & Olive Grove for some local olive oil. They grow and process fruit from about 2000 olive trees in their on-site olive mill. The shelves are stacked with premium EVOO, oils infused with truffle, garlic, chilli and lemon myrtle, jars of table olives, dressings and condiments, as well as olive-based skincare. ​You'll catch killer views as you cruise the country roads but seeing the sun rise over the vineyards from a hot-air balloon will make your heart go boom, according to the many posts about Balloon Aloft on Instagram. You need to be an early riser (sorry to say I'm not) as owners Nicola and Matthew Scaife meet passengers around 6am in winter, but they say it's the most beautiful part of the day, drifting over the vineyards stretched out below surrounded by the craggy mountain range. ​If you prefer sunsets to sunrises, you'll be smitten with the spectacular views on one of the many trail rides offered by Hunter Valley Horse Riding Adventures. There are a great range of riding options on the 121-hectare property trotting through bushland with awesome views of the mountains and north to Barrington Tops, but romantics give the sunset rides the thumbs up. Who doesn't love riding on the top deck of a double-decker bus? On Saturdays you can see the sights from Lovedale Brewery's canary yellow, double-decker bus. They get it out of the Crowne Plaza garage and you can hop on for a three-hour tour sampling some local delicacies including wine, beer and cider. ​When it's time to hit the sack there are oodles of places with peaceful panoramas and country comforts. The plush pads at the sprawling Crowne Plaza Hunter Valley resort are ideal for those who want all the bells and whistles including a golf course, pools, restaurants, bars and spa. If you prefer complete privacy, Lillian's on Lovedale may fit the bill. Set on 25 acres the two-bedroom cottage is quaint and quiet with a cosy open fire and a complimentary bottle of Allandale wine on arrival. There's more wine on offer at Midnight's Promise and Emma's Cottage. Both offer accommodation on a working vineyard and they're ideal if you're hanging out with a group of friends. Midnight's Promise Estate has three self-contained cottages accommodating up to 12 people and it's just a hop, skip and a jump to the boutique cellar door from your front door. If you have a big busload, Emma's Cottage Vineyard has four cottages that sleep up to 22 with views of the vineyard and beautiful rose gardens. It's just a short stroll to the cellar door for a tasting of the estate-grown wines, grazing in the cafe or gazing at the art in the gallery. ​Then there's Bluebush Estate, Lovedale Cottages… yep, you guessed it. Lovedale is a hotbed of cabin and cottage accommodation so check out the full list here.